In addition to covering a history of free and open source, The Daemon, the Gnu, and the Penguin explores how free and open software is changing the world. 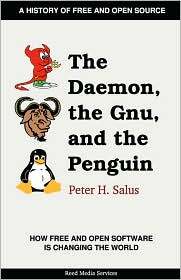 It is authored by Peter H. Salus, a noted UNIX, open source, and Internet historian and author of A Quarter Century of UNIX and Casting The Net and other books. Salus has interviewed well over a hundred key figures to document the history and background of free and open source software. In his book, Salus reaches back into the early days of computing, showing that even in "pre-UNIX" days there was freely available software, and rapidly moves forward to the Free Software movement of today and what it means for the future, drawing analogies and linkages from various aspects of economics and life. Dr. Salus is the author of "A Quarter Century of UNIX" (which you can obtain here, here, here and here) and several other books, including "HPL: Little Languages and Tools", "Big Book of Ipv6 Addressing Rfcs", "Handbook of Programming Languages (HPL): Imperative Programming Languages", "Casting the Net: From ARPANET to INTERNET and Beyond", and "The Handbook of Programming Languages (HPL): Functional, Concurrent and Logic Programming Languages". There is an interview with him, audio and video,"codebytes: A History of UNIX and UNIX Licences" which was done in 2001 at a USENIX conference. Dr. Salus has served as Executive Director of the USENIX Association.